WHY GO. Morning fog transforms the landscape into the hazy tableau of an impressionist painting in the very place considered the Birthplace of American Impressionism, Old Lyme CT. In the late 1890’s widow Florence Griswold opened her home to American artists fresh from studying in France, forming the country’s first European-style Art Colony – an “American Giverny”. Artists and those who appreciate their work as well as serious birdwatchers still find their way to this exquisite section of coastal Connecticut, right between New York and Boston. This Getaway immerses you in the familiar blurred landscapes captured in famous paintings, introduces you to emerging artists, and of course, pairs these singular experiences with exceptional cuisine and lodging. VISIT: Florence Griswold Museum. To keep from losing her home after the death of her husband, Florence Griswold began renting rooms to artists drawn to the brilliance and clarity of natural light in Old Lyme, CT – the “Lyme Light” as it was called. In the early 1900’s, Childe Hassam, Henry Ward Ranger, and dozens more moved in, creating America’s first Impressionist Art Colony and delighting Griswold by painting on her home’s paneling, cupboards and doors. Now a multi-acre complex, The Florence Griswold Museum encompasses the Georgian-Style main house, a contemporary metal-sheathed gallery building, a large barnlike studio and acres of gardens and plantings set on the Zen-serene Lieutenant River. VISIT: Lyme Academy. Roughly 200 students from all over the world attend the accredited Lyme Academy College of Fine Arts originally founded in 1976 in the basement of the Lyme Art Association building. Stop in to see ever changing exhibits from the next generation of fine artists. DRIVE/BIRDWATCH: Smith Neck Road. Like most lanes in Old Lyme, this one winds through a tony neighborhood of large waterfront homes. Smith Neck Rd. ends at a quiet boat-launch, where you’ll also find a bird-watching deck. Come in the misty morning and you may see small motorboats emerge from the fog then disappear just as quickly, or sailboats moored in the narrow ribbon of water that separates you from the Ospreys, Blue Herons and Snowy Egrets on Great Island, also known as the Roger Tory Peterson Wildlife Refuge, named for the Old Lyme resident who wrote the seminal A Field Guide To the Birds. PADDLE: Rent a kayak at Black Hall Outfitters. 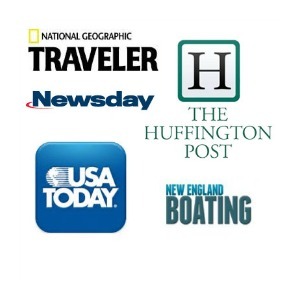 The Connecticut River Estuary Canoe/Kayak Trail Guide directs paddlers up and down the Blackhall and Back Rivers through what appears to be a tasseled-topped version of the Everglades. Dozens of Osprey nests dot the salt marsh, like mini War of the World tripods, and on the best of days you’ll find fauna festooned with dozens of white egrets – like living Christmas trees. This is the landscape that inspired Roger Tory Peterson and for birders or bird photographers, there is no equal. WALK: DEP Marine Headquarters Boardwalk. This quarter mile boardwalk traverses the Connecticut River from DEP’s parking lot, ducks under a photogenic railroad bridge then ends up suspended over a salt marsh alive with birds. Go late afternoon on a temperate day, and you’ll share this quiet time with fishermen and locals soaking up the fading light. The effect is yoga-like serenity. SHOP: If you want to drop a few to a few dozen grand on a classic piece of art (or just gaze), the Cooley Gallery, 25 Lyme St., (860) 434-8807 is at your service. EF Watermelon, 24 Lyme St., (860) 434-1640, houses some of the most unusual crystal and stone objets d’Art in the country. And of course the Florence Griswold Museum Gift Shop is an excellent place to purchase books, jewelry and kits for your budding artist. THEATER: Katharine Hepburn Cultural Arts Center aka “The Kate.” Cross the CT River into Old Saybrook, where actress Katharine Hepburn lived in her secluded beachfront mansion until her death at the age of 95. 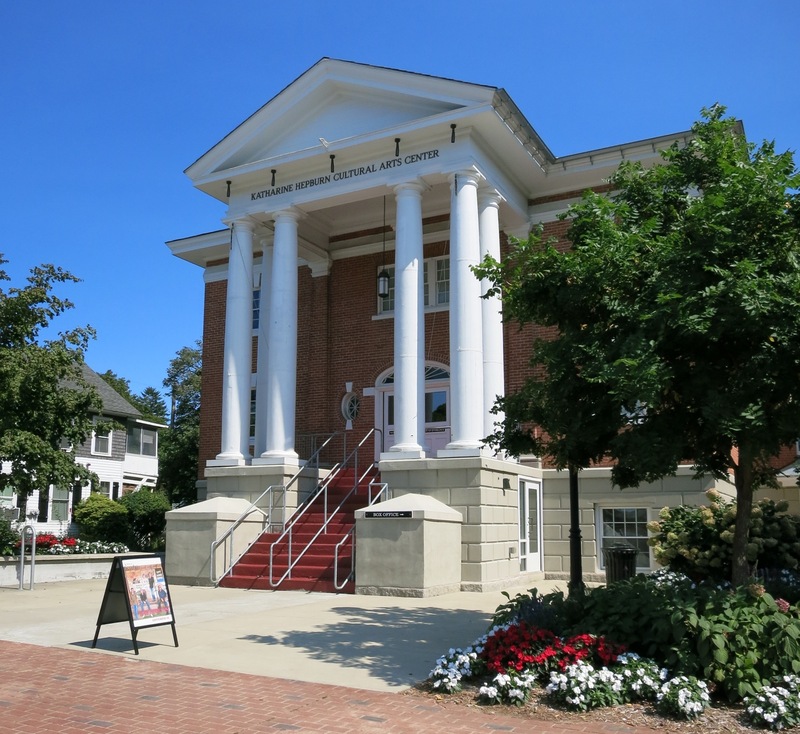 Take in a show at the new Katharine Hepburn Cultural Arts Center in the center of town. “The Kate,” as the Arts Center is affectionately known, hosts dance, theater, opera and film events in a cozy 250-seat auditorium. JAZZ: Old Lyme Inn’s Side Door Jazz Room. This grand dame boutique inn is bringing New York City caliber jazz and cool nightlife to the quiet Connecticut shore. RECHARGE/COFFEE: Ashlawn Farm Coffee. You’ll need a GPS to find this coffee shop in the midst of endless pastureland and fields. 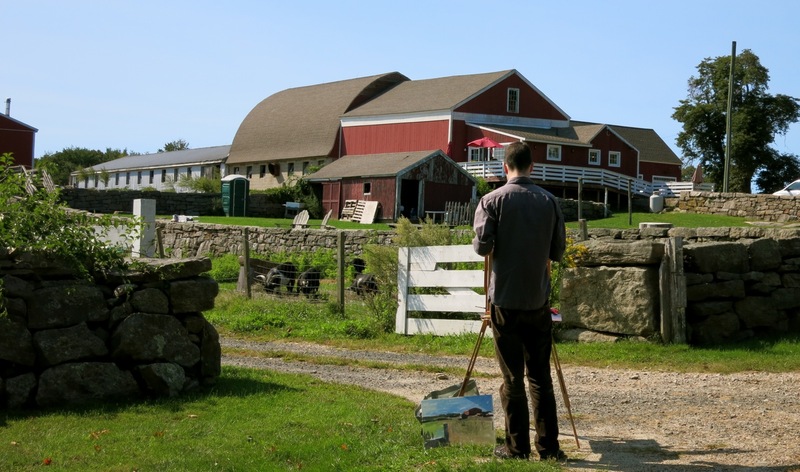 Driving up, you might very well encounter a painter at his easel, capturing this transcendent panorama on canvas. Ashland Farms, which roasts its own brand of coffee and also offers pastries and sandwiches, is an ersatz office for creative types and independent contractors who mingle to share ideas and life stories. It’s such a “local knowledge” kind of place I feel a bit sheepish even mentioning it. But I have to – it is so unique and you just won’t find a better cup of Aztec Mocha anywhere else. EAT: Chestnut Grille at Bee and Thistle Inn. A favorite of celebrity chef, Jacques Pepin (who lives nearby), the seasonal farm-to-fork cuisine is outstanding, the vibe convivial, and candlelit atmosphere the perfect place to pop the question or rekindle a romance. Menu changes often, but you can never go wrong ordering the popular Vermont Cheddar Mac and Cheese ($12), White Bean Dip on Toasted Baguette ($6) or any other “Contemporary New England” dish. STAY: Bee and Thistle Inn. 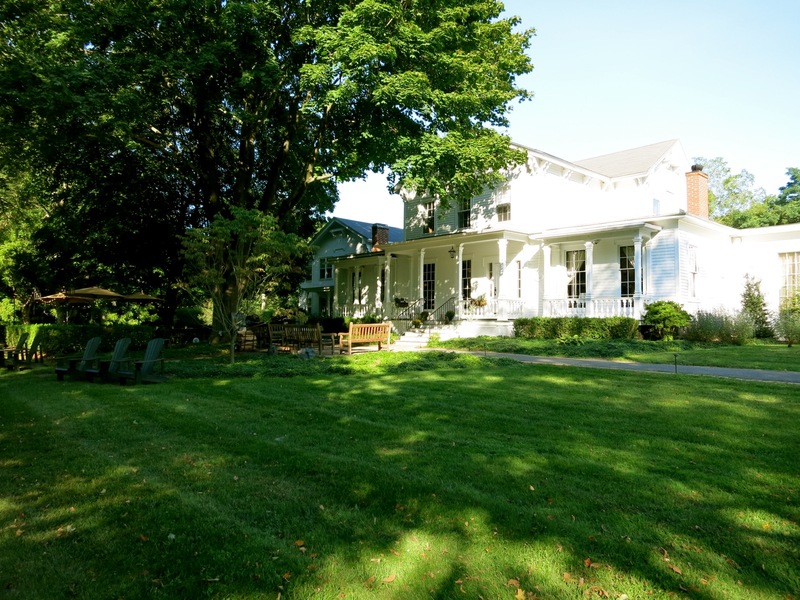 Adjacent to Flo Griswold’s place, former owners of this 1756 home must have borrowed a cup of sugar from the artists in residence next door – or at least have had some interesting conversations with them. Like Griswold, new owners Linnea and David Rufo have befriended emerging artists of every medium, who pop in from time to time to visit their masterpieces, which are on display throughout this elegant and eclectic place. 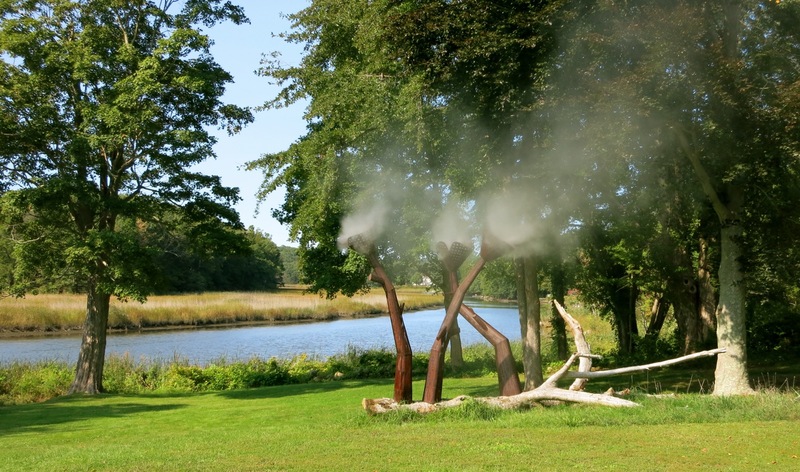 Tremendous “mussel shells” – the work of a local sculptor – are draped Dali-like over tree branches outside on an expansive lawn where you’ll also find lots of seating and Adirondack chairs facing the same salt-marsh river that early impressionists painted. The Rufos source their coffee from Ashlawn Farm up the road, and make it a point to purchase ingredients as locally as possible. Cookies at turndown and Bee Kind products in the plumpy-bed rooms are just the icing on the cake of this warm and tantalizing inn. 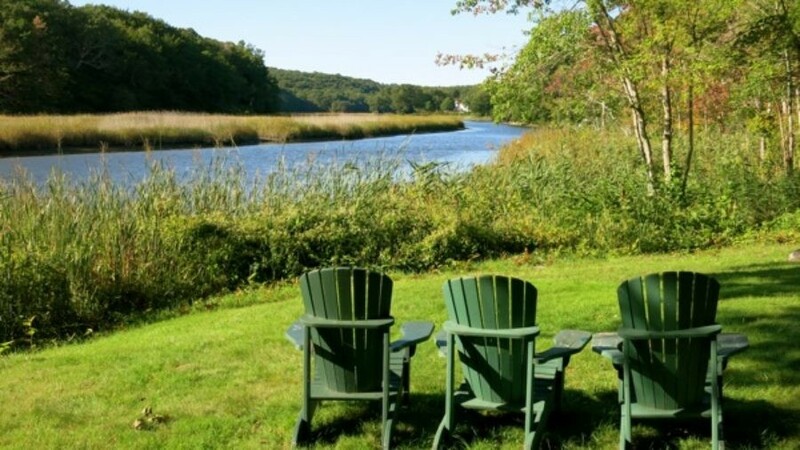 STAY: Old Lyme Inn. It’s gone through a rickety faded phase, and has now been de-fussied and contemporized for a new generation. Time will tell if the just-opened Jazz Club (The Side Door) and new chef hired from the White Barn in Kennebunkport, ME will turn things around at the restaurant, but the future looks bright for the old gal.